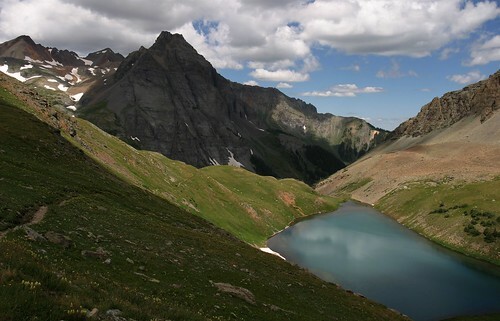 In the Mount Sneffels Wilderness, near Telluride, lies one of the most scenic hiking trails in Colorado. 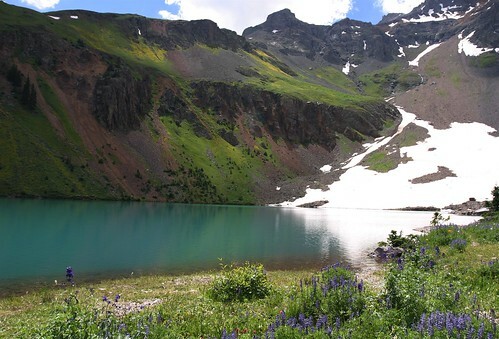 It is a moderate hike, going 3.5 miles from 9,400 to 11,000 ft. of elevation. 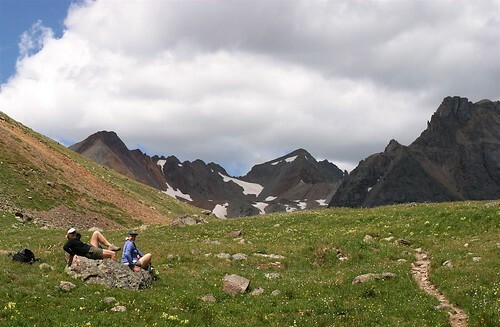 We traveled to Southwest Colorado with our friend and hiking companion Beverly Gholson. 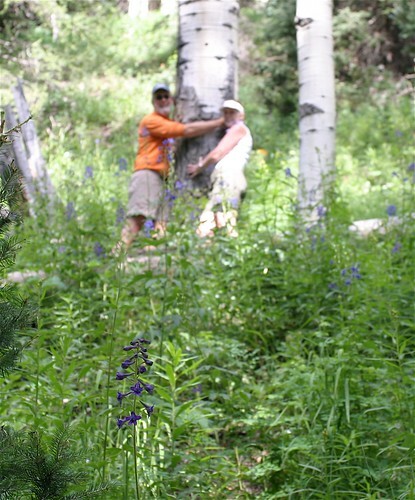 Her brother had told her about a hike where you pass Aspen trees you can barely reach around. 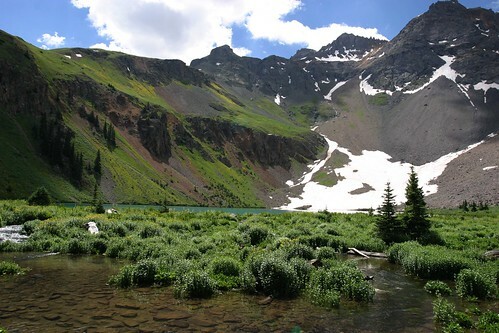 The trail climbs steeply through aspen, spruce and fir to the three Blue Lakes, just at timberline. 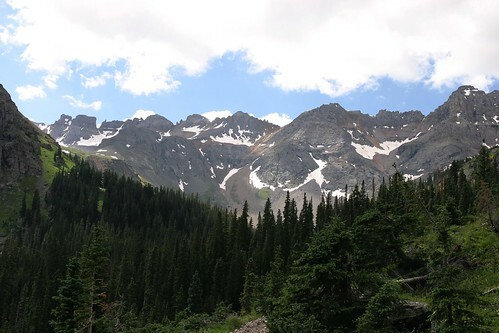 You can summit Sneffels from here, but it makes quite a day. Here Beverly and I hug one of the huge Aspens. You get glimpses of the ridgeline as you ascend the hike. There is a good bit of water along the trail, bringing out the wildflowers. Here, Beverly and I prepare to cross a stream on a log. Wildflowers line the waterways with blooms. 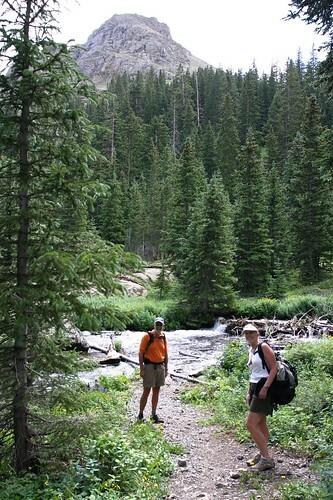 We approach the first lake, hiking along the outlet stream. 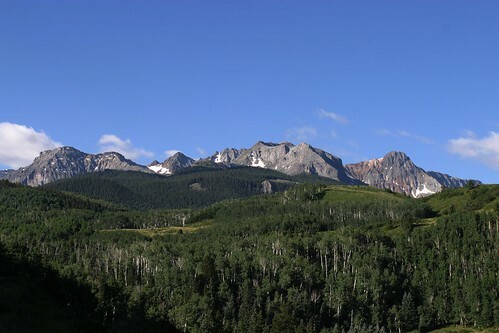 The trees are disappearing near treeline, and the views of the ridges and snowfields come into view. 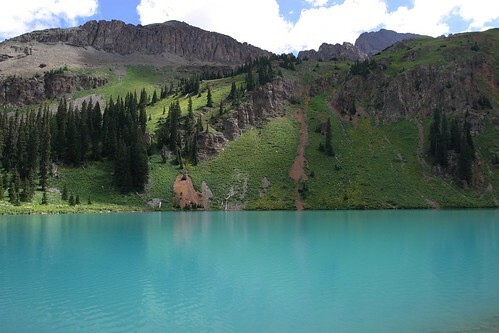 The incredible color of the lakes comes from glacial flour, fine particles of rock that suspend in the water, since this lake is fed with glacial runoff. 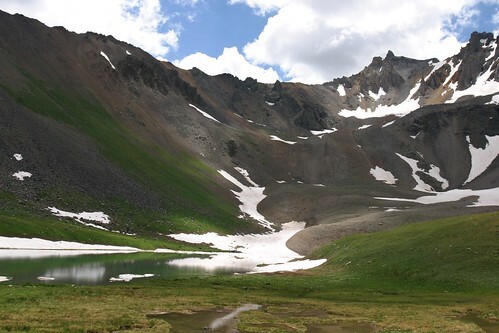 As we continue our ascent, we find the second lake. It is a bit deeper in color, well-suited to the name. Excitement builds as we close in on the third lake, nestled under the ridgeline. 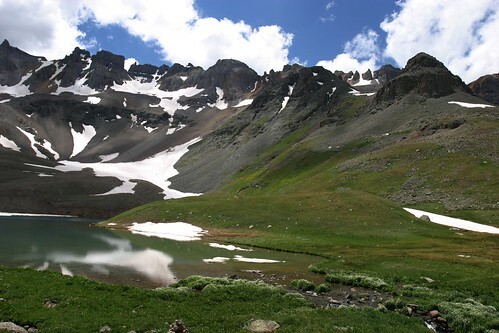 We are now in the Alpine zone, above treeline, admiring the beautiful sky, mountains, snowfields and wildflower meadows surrounding the lake. Genie and Beverly pose as I capture the moment's rest. Some hikes are journey hikes, with good scenery along the way, but no absolutely beautiful destination. This is definitely a destination hike, the best is saved for last. After lunch, as the clouds begin to gather, we start our descent, tired but inspired by the peace of experiencing God's wonderful creation. 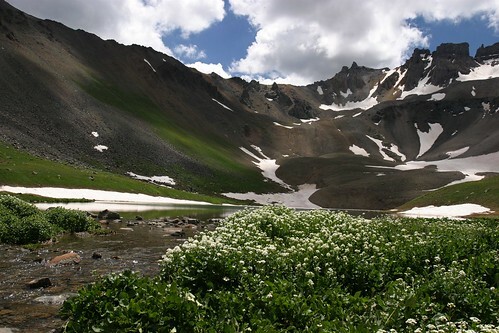 Thanks to those who worked to preserve this pristine area as the Mt. 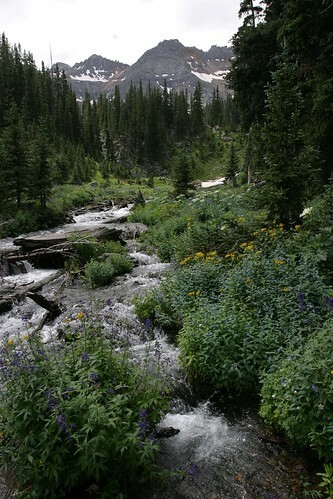 Sneffels Wilderness so every generation can be touched by the beauty. May you experience the bliss of seeing God in nature in such spots as this.